I read this article and found it very interesting, thought it might be something for you. The article is called Why Tur Dal Is Rs 200/kg (And Why It Will Be As Much In 2016) and is located at https://archive.indiaspend.com/cover-story/why-tur-dal-is-rs-200kg-and-why-it-will-be-as-much-in-2016-2016. Son: Maa aaj dal khane ka man ho raha hai (Mum, I feel like eating dal today). Mom: Itne paise nahi hai, chup chap butter chicken kha le (We don’t have so much money, be quiet and eat butter chicken). That bitter humour, doing the rounds of social media, represents popular resentment as a protein-rich food staple, tur dal—or split pigeon pea in English—touched Rs 210 per kg, more than double the price of a year ago. A nationwide crackdown on pulse hoarders across 13 states yielded 75,000 metric tonne of pulses, according to this NDTV report. The situation grew serious enough for Finance Minister Arun Jaitley to convene inter-ministerial meetings twice in a week and complain that states were not doing enough. But these were short-term reactions to what is now a long-term problem with pulses, about 80% of which is produced in India, provides mostly poor farmers with a livelihood and—until recently—was a reliable, rich source of vegetable protein. The current spike in dal prices is because the summer crop, or kharif (June-October), is yet to arrive in the market. The harvest is just over. The current stock being sold is the stocked (or hoarded) produce of the winter crop, or rabi (November-April), of 2014-15 that came to the market in April and May 2015. Tur dal is just one of the five major pulses produced in India. Tur is produced only in the kharif season, a reason why there was the highest escalation in its price compared to other pulses. Rabi production of pulses is around 70% of the total output. Demand is also high during the festive season, from Janmashtami to Diwali (August to November), which further bolsters the acceptance of high prices among consumers. So, traders make the most of this window of opportunity—between the time of sketchy information about kharif output and market entry of that produce—by selling pulses at inflated prices. But the real explanations for dal prices—and why they may reach the same levels next year—are more complex. Two consecutive years of monsoon failures (with a rainfall deficit of 10% or more). Negligible increase in the government-fixed minimum support price (MSP) for pulses. The Indian farmer’s inability to grow more dal per hectare. The growing tendency of Indians to get their protein from eggs, milk and chicken, as IndiaSpend recently reported. These are the factors that have created a perfect storm for dal farmers, traders and consumers. India, the world’s biggest producer and consumer of pulses, produces 16-20 million tonne–or a quarter of global production—with productivity of 600 kg to 800 kg per hectare, among the emerging and developed world’s lowest. Even poorer Myanmar produces twice as much per hectare, Egypt more than four times as much. Rainfall, following the June-to-September cycle, has been irregular in the Indian subcontinent, possibly a consequence of climate change, as IndiaSpend has reported. The growing spatial and temporal variation has had an adverse effect on agriculture in India. Only 16% of farmland for pulses in India is irrigated (1). So, 84% of pulse farming depends on increasingly erratic rainfall. Production of pulses during the kharif season in 2004-05 declined to 4.72 million tonne from 6.16 million tonne because rainfall was lesser by 14%. Similarly, a deficit of 14% rain is expected to result in a pulses output of 5.56 million tonne (first advanced estimate) during the kharif season of 2015, almost the same as the last crop season. The total production of pulses started declining steadily after a peak of 18.24 million tonne in 2010–11. Production of pulses has been trailing demand for 50 years, forcing Indian traders to rely on imports, which has now reached about 15% of demand. 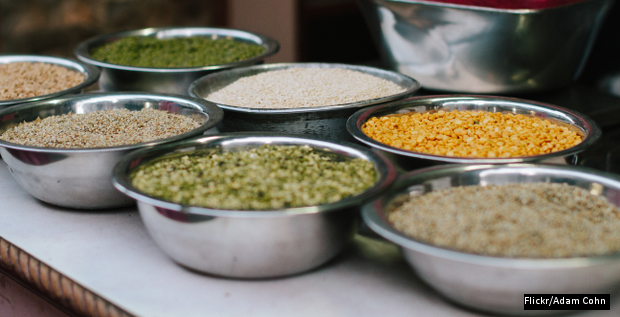 India imports more than 3 million tonne of pulses every year, making the recent seizures 5% of the total import. The import bill for more than four million tonne of pulses in 2014-15 was Rs 15,990 crore. The total central plan outlay for agriculture during the same year was Rs 11,530 crore. After the production drop in 2011-12, because of below-average rainfall and a 6 to 10% increase in MSP for pulses, production increased over consecutive years (2012-13, 2013-14) as MSP increased 15 to 25%. The monsoon in 2014 suffered a 12% deficit, and MSP increased between Rs 50 and Rs 100 per quintal. The scarcity grew with a 14% deficit monsoon in 2015 and yet the increase in MSP was less than Rs 100 per quintal. Although a bonus of Rs 200 per quintal was given for tur, moong and urad, total production declined to 17 million tonne. While small and medium farmers have increased over the past 20 years, large farmers have reduced in number for almost all crops, according to the Agriculture Census 2010-11. With more people and smaller land holdings involved in the production of basic foodstuff, the bargaining power of the inherently poor pulses-growing farmer is low. While the area under foodgrains (cereals and pulses) and oilseeds increased by 5.5% and 14.6% over the last 20 years, the area under certain cash crops (sugarcane, cotton and spices) has increased between 22.9% and 32.3 %. Another phenomenon that has affected pulses production and the farmer is the diversification in sources of protein intake. The per capita consumption of pulses has been in the range of 9 kg to 12 kg per capita per year in urban areas and 8 kg to 10 kg in rural areas in the same time period. That is not a significant increase. As we said, four factors—monsoon failure, government inaction regarding MSP, shift to lucrative cash crops and availability of alternate protein sources—have caused the pulses market to become something of a Russian roulette. If market compulsions make this inevitable, what should the government do? “The government needs to create a crop-neutral incentive structure for farmers, which is at present skewed in favour of rice, wheat and sugarcane”, Ashok Gulati, Infosys Chair Professor for Agriculture and Shweta Saini, Consultant at Indian Council for Research on International Economic Relations (ICRIER), wrote in a column in Indian Express recently. Without government intervention and a long-term plan, prices of pulses may stay high next year—and the butter-chicken joke may be recycled. A very well written and deep studied review on the current scenario. Also liked the solutions part for the challenges govt is facing. Keep it up the good work..